What does a busted phone and a sad Snickerdoodle have in common? Not much, actually. Just a little jealousy on my part that my husband got a new phone. He got an HTC Inspire. BIG upgrade from a basic texting dumphone (Samsung Impression). I had to resist adding the Gingerscraps app to it. What? 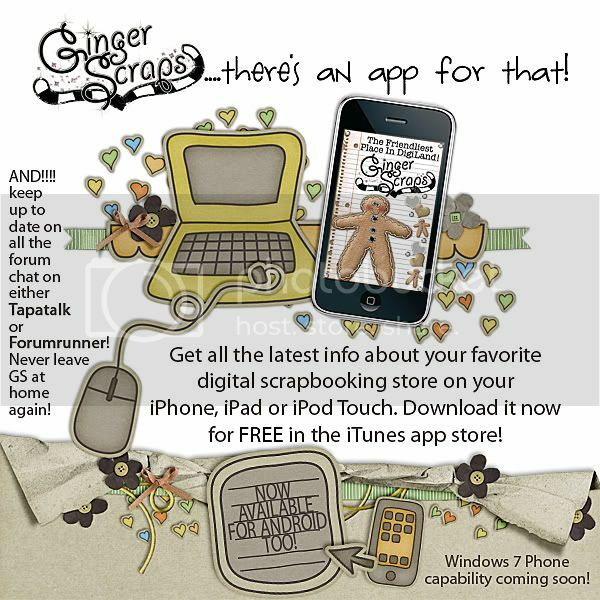 You didn’t know that Gingerscraps has an Android app? Well, they do!! They have one for the iPhone (or other such devices) and for Windows 7 phones! Sweet, right? Reminds me that I need to get onto someone about updating this ad! Windows 7 is available! Other news? What? Really? You still want to hear me? On the Facebook page, Jacque wonders what everyone did on Monday. Personally, I was in bed. Sinuses. Blech! Anyone else abhor them? On the forum, Jen, of Jen Yurko Designs, asked which app to use: Forum Runner or Tapatalk for her Droid. As a future owner of an Android (I’m getting the same one as my husband ). Looks like BOTH are getting good reviews. For Windows users: I suggest Board Express. Speaking of Android apps, I posted, looking for the BEST apps for Android. I’m an app girl. I like to make everything all me and personal. I can do that with apps!! Now, it’s March. Yeah, it’s March already. Where did February go? How did you do with the challenges? Yeah, I didn’t do too well. Goal for March for me personally is to do at least four of them!! One I’m definitely trying is the Technique Challenge. Selective coloring, basically, is what you’re learning. Plus, there’s an ADORABLE kitty in the thread!! I swear I heard it purr at me! Another one I’m going to attempt to do is the FONT CHALLENGE!! Considering a certain popular show on ABC, this font is PERFECT for that. Anything related to reading or something! Hey, you could use the new BUFFET on it!! The Reading Room! March’s book is The Hunger Games!! Join us for discussions starting March 07, and an unscheduled at the moment chat at the end of the month! You still have a day or so!! Go check it out!! Well, I think that’s about it!! If you have anything you think should be brought forth for a weekly round-up on Gingerscraps, give me a holler on Gingerscraps (I’m Sarah on there)! I’ll see what I can do!! Hi! Sarah here! I’m new to the blogging/ad team of Gingerscraps! I’m not new to the whole team, though. I’m part of Creations by Julie & Pretty in Green’s CTs. I’m also part of the store CT. So, when I say I love GS, I think it’s pretty obvious!! So, we’ll start with a few of the challenges that are happening. A new template challenge has started. This half of the month is hosted by JoyLynn of Blue Heart Scraps. The template is just gorgeous! Awesome, right? Make sure you check out the challenge!